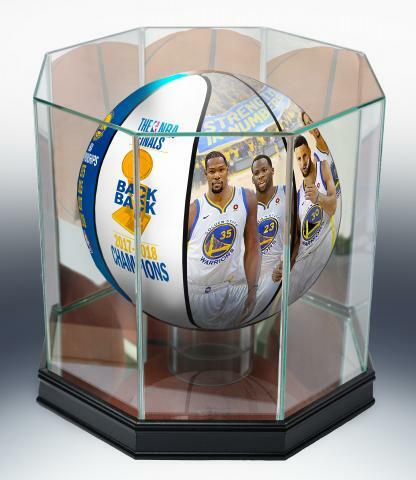 Get a custom display case for your EXCLUSIVE Warriors 2018 NBA Champions Art Ball when you order this Combo Set. This ball is unavailable anywhere else and features the reproduced work of noted artist and Bay Area native Jolene Jessie. Get your ball and case combo now before they are gone. 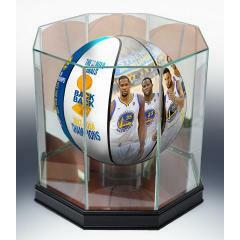 Ball comes with a numbered certificate and this offer is only available while these balls remain in stock. The Art Basketball is a size 4 basketball which is slightly smaller than a regulation NBA Basketball. Due to the nature of this offer we must charge your credit card for the full price immediately upon taking your order to ensure we reserve a ball for you. We will confirm your order by Email. This ball is not game used. Please allow 4 to 6 weeks for delivery. This ball is fully licensed.